A review by Marc Levesque "Time2watch"
As many of you know me by now, I�ve owned many sports watches, ranging from a TAG Heuer 1500 to my present day Omega Seamaster Pro. Over the years, I�ve found my tastes have changed, instead of longing for the large bulletproof sports watch, I�ve grown fond of clean, easily readable pilot style watches. In my search for one of them in my price range ($700 to $1200), I�ve stumbled upon the Minerva Pythagore. While making inquiries on this particular model, I was trying to decide if should opt for the larger Pythagore II (Grande) or for the original Pythagore. When a good friend volunteered to lend me his 34mm Pythagore to see if I could live with its size, I jumped on the opportunity to give it a test drive. I�ve had it for a little over two weeks now and I put this little review together in order to help others, who might be trying to make the same decision as I am; is a Pythagore for you? And which size? Hope you like it. When I first saw the Pythagore, over a year ago, I couldn�t help but think, do people actually wear these small watches, at the time I had just traded my GP Laureato for a Sinn 203st because the GP was too small. I remember noticing how well finished the Minerva was and I knew it wasn�t going to be the last time I saw one up close. Its case measures 34mm in diameter, 41mm from lug to lug and a meager 8mm thin, by far the smallest watch I�ve ever worn. The lugs are very soft and well-rounded keeping this watch easily centered in my wrist. 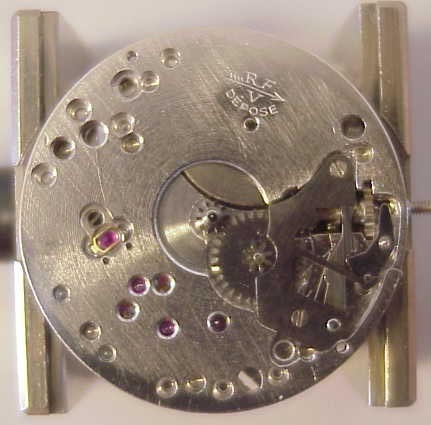 The signed crown measures 4mm in diameter, which is sufficiently large, and makes for daily winding a true joy. The ultra-thin bezel, measuring only 2mm, is what makes this watch appear much larger then it truly is. The entire case is made of mat finished SS with polished SS around the see-through sapphire back and underneath the lugs. The case back is screw down, which enables it to withstand 30m of water-resistance and reveals the nicely decorated Minerva Cal. 48 mov�t. 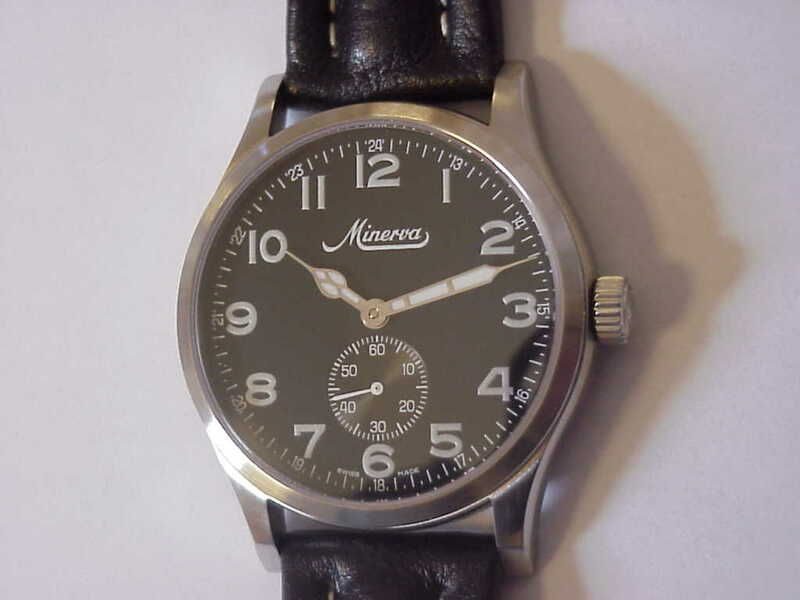 It is engraved �MINERVA, CALIBRE 48, REF A481� and the appropriate serial number. The sapphire crystal is slightly domed, with no any anti-reflective coating and it sits about � mm above the bezel. The dial, measuring a huge 28mm in diameter, is as clean as I�ve ever seen, with no excessive writing, just �Minerva� at 12 o�clock and �Swiss Made� at the bottom, that�s it, simple. The hour indices are all Arabic numerals and are coated with tritium paint. 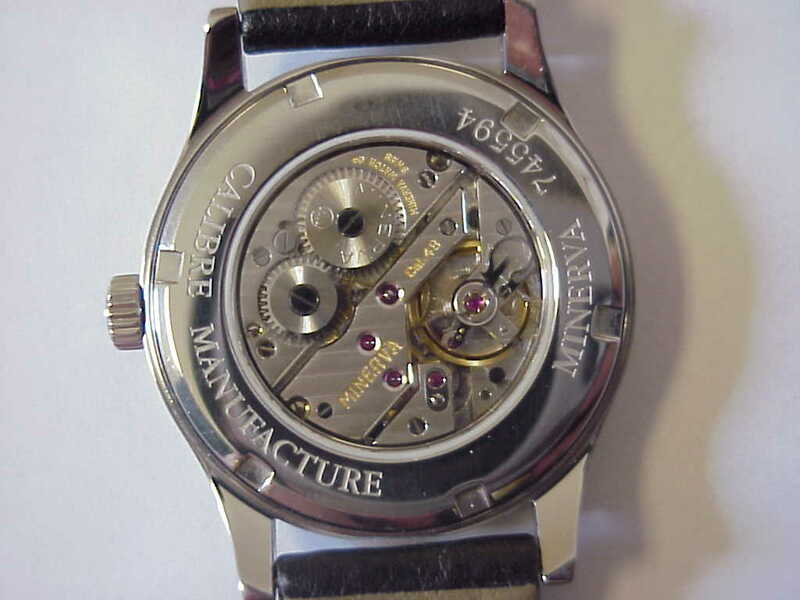 The seconds are indicated by a sub-second dial at 6 o�clock, which in turn cuts into the numeral, very nicely done. 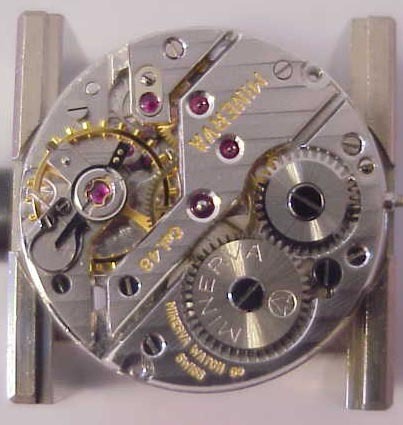 The vintage style hour and minute hand are very long and make this watch the easiest I�ve ever had to set on the hash marks. *RM's cal. 48 has the Swan neck micro-regulator, the one I reviewed does not. The Cal. 48 uses 17 jewels, has a power reserve 45 hours and beats at a rate of 18,000 alternations/hour, a rate that seems very slow, but is incredibly hypnotic to listen to. There are also five rhodium-plated bridges with a �Cotes de Geneve� d�cor, which make this mov�t as pleasurable to look at, as it is to listen to. Another joy is being able to wind this everyday; I�m surely going to miss this morning ritual once I return it to its rightful owner. So far, I�ve timed it to be about +2 sec/day, but I haven�t been wearing it on a daily basis. The ostrich strap supplied with this watch is thickly padded, but a little on the slim side. It is 18mm at lug width and tapers down to 16mm at the buckle. Unfortunately it was either too short or too long for me and since this was not my watch, I didn�t want to make my own adjustments. Instead, I replaced it with an older 20mm Hirsch calfskin strap I had lying around, I trimmed it to look like the IWC UTC strap, I liked the look very much, though my wife thought it looked quite cheesy. The tang buckle is singed with the Minerva �arrow� emblem, and is as solid as any I�ve seen. The strap is also signed Minerva underneath. IMHO, this is by far one of the most �honest� watches I�ve ever had the pleasure to review. I had never heard of Minerva until I stumbled onto TZ over 3 years ago, since, I�ve heard many great things and I�m pleased to report they are all true. A simple watch, well crafted, a pleasure to wind, listen to and wear. I have to admit that 34mm has grown on me, but I will definitely be going for its larger brother the Pythagore II (Grande), I just cannot get used to such a small watch. I�d like to thank all of you for reading. 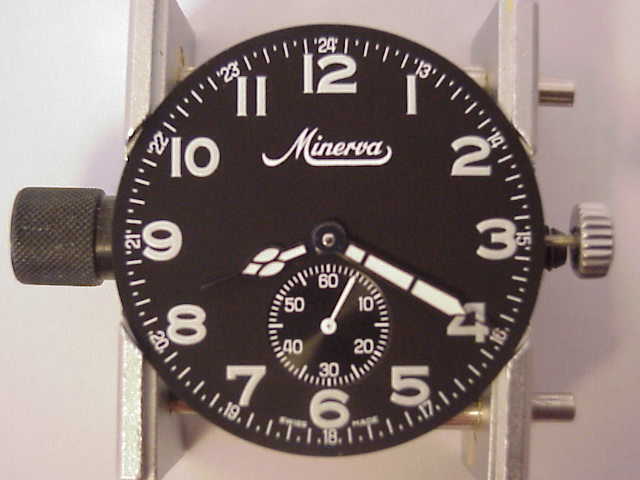 I�d also like to thank Dariusz for lending me this wonderful timepiece and Roland Murphy for his excellent photographs, RGM is the official service center for Minerva in the USA. I�ve attached a few other shots Roland has taken of a Pythagore II. Hope you like �em.